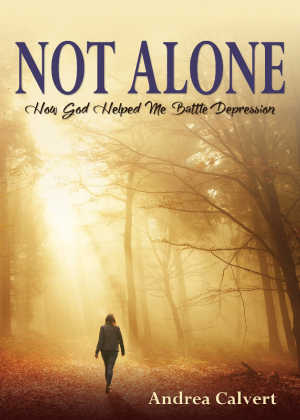 Canada’s Andrea Calvert has just released Not Alone: How God Helped Me Battle Depression through Word Alive Press. She’s also the daughter-in-law of some close friends who shared some of her story with me. I’ve been following her on Twitter and also just became aware of her blog, Inspiring Life Chats, where she’s been writing for nearly a year. I want to begin with the publisher’s synopsis of the book, and then share a short excerpt Andrea sent us just for readers here. Angry and hurt, Andrea didn’t want to have anything to do with God. How could she when, one day shy of her eighteenth birthday, she had to watch her mother being wheeled into the operating room of Toronto General Hospital to receive a liver transplant? How could a God that “loved” His people allow them to suffer so badly? Why did she have to spend so much time in and out of hospitals, watching the strongest woman she knew endure test after test? Watching this happen, Andrea came to the conclusion that no god would do that. Then, on April 27, 2011, it was time to say goodbye. After ten long months of waiting for a second organ donation, Andrea’s mother made the decision to let go-it was the hardest thing Andrea had ever dealt with up to that point. The loss of her mother led her into a downward spiral of depression, PTSD, and anxiety. Andrea lost years of her life and still battles to this day with keeping her depression under control. Jesus reached down and opened Andrea’s eyes at the darkest point of her depression. Searching for a way to deal with her pain, she called out to Jesus, who answered her prayers and called her back into His loving arms. What He has done in her life is nothing short of amazing-Jesus gave her purpose again! I saw a therapist and was diagnosed with post-traumatic stress disorder, depression, and anxiety. I’d never considered depression and anxiety as an “illness.” I always figured that if you were suffering from an illness, you had a problem with your physical health, not your mental health. Mental health related to things like bipolar disorder or schizophrenia, and I didn’t have either of those, so I was fine. I absolutely hated myself. My feelings of failure returned, and I withdrew into myself. It was like taking five steps forward and ten steps back. I went back into the darkness. Depression is often like this; once you’ve dealt with some past hurt, you only have a few days before the next issue rears its ugly head. It’s a constant uphill battle. Even when you think things are going really well, someone can trigger an old memory and you’re right back where you started. There I was, back where I’d started, after five months of counselling and six months of medication. I had to start over. In essence, I was “back on the couch” for more sleep. In actual fact, I’d been couch-bound for about six months. I’d never really freed myself from the lack of self-worth, anxiety attacks, and isolation. I thought no one wanted to be around me, because I certainly didn’t want to be around myself. Even at rock bottom there was someone there with me. He had always been there. When I saw Mom under a mountain of hospital blankets, He was there. On the phone saying goodbye to her before she went to Toronto that rainy October night, He was there. Through the ten months of sickness and the “Liver That Never Was,” He was there. And now, when I needed a lifeline from the depths of darkness, He was standing up, dusting off His white robes, and getting ready to extend His hand. Jesus. He was with me, and He was sending someone to me. He was bringing me back to Him. The 118-page paperback is just the right size for those who find themselves in the aftermath of a traumatic loss that is causing stress and depression. Priced at only 11.99 CDN it’s also affordable to give away to someone in the middle of such a situation. ISBN 9781486616107 | 11.99 US / 11.99 CDN | Distributed to stores by Anchor Distributors and Spring Arbor (US), Word Alive (Canada) and available for customer purchase wherever you buy books. After my time serving on staff at a local church came to an end, we took a two-year break from that church and attended another in town, somewhat renown for its children’s ministry and Bible teaching. The pastor at the time was an excellent speaker, and his oldest son, Benjamin, was in a Sunday School class with our oldest. Flash forward more than a decade and we learned that Ben had been diagnosed with a form of leukemia. To say this seemed to hit close to home was more than an understatement. It seemed to me like only yesterday the kids were saving seats for their dads at a Sunday School Father’s Day party by crossing their legs over the empty chairs next to theirs. My wife heard about a Facebook group, Pray for Benjamin Elliott, and as new feeds came in, she would forward them to me by email. Praying for Ben became part of our nightly prayer routine as a family. I asked my wife to take another look at those Facebook entries through the book, and share a few thoughts from a mother’s perspective. The Ben Ripple is a challenging read. Walking through another person’s pain and loss, even in retrospect, takes some doing, especially having been one of the followers of the ‘real time’ Facebook updates, which comprised an honest, hopeful and wounded journaling from a woman of faith and intelligence whose life was suddenly shaken loose. In this book, Elliott brings back those first raw outpourings, ties them together with some more objective reflections on what was happening in the family’s lives at the time and closes each chapter with practical suggestions for those dealing immediately with cancer, and for those on the periphery who just want to not say or do the wrong thing. 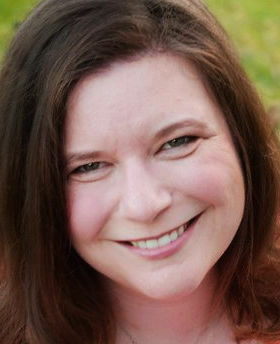 Her writing is both skilled and passionate, drawing the reader closer to understanding and empathy with a situation that most of us will never experience – the loss of a child – and one that more and more of us live through – fighting cancer. She takes time to explain the treatments, with their setbacks and successes, and to appreciate the medical professionals who were involved in her family’s lives. All in all, it is important for us to know stories like Ben’s. The places where God meets us face to face, and the places where he stands quietly behind us. What the family next door might be going through and what they may deal with from one day to the next. It’s been said that we live in a world that has forgotten how to lament — to cry out to God our pain and fear and loss. This book is just such a thing, but like so many of the laments in Scripture, it ends on a note of “nevertheless…” The possibility of healing, the value of trusting, the necessity of faith in one who loves us. The Ben Ripple is a remembered and continuing journey well worth walking. The Ben Ripple is published in paperback by Word Alive Press and available through them in Canada and through Ingram and Spring Arbor in the U.S. A copy was provided to Thinking Out Loud by Graf-Martin, a Kitchener, Ontario based promotion and publicity agency which comes alongside Christian publishers to provide key titles with enhanced visibility. Lets Have a Bible Study! On Thursday, I posted the results of a U.S. pastor’s congregational survey of the “burdens” that members of his church identified as things they were dealing with. 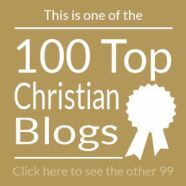 Later that day, I considered the list in the light of a particular scripture verse in Isaiah, and posted my thoughts at Christianity 201. I’m reprinting it here not because it’s one of my best posts or an example of my finest writing, but because it basically shows my Bible study process taking place. Some simple steps here — not in order — include (a) checking the context; (b) using multiple translations; (c) using study Bible notes; and (d) using Bible commentaries. And of course, (e) asking blog readers for their suggestions! He was wounded for our transgressions. Those words, from the KJV of Isaiah 53:5 are probably among the scripture verses most known by heart. If you grew up Pentecostal or Charismatic, there is no escaping teaching on that part of the verse; no escaping the connect-the-dots between the scourging Christ suffered and the healing that is available to us today, in the 21st century. Isaiah, in this Messianic prophecy is saying that Christ’s suffering has brought us forgiveness for our transgressions and iniquities as well as (if you’re not dispensationalist) healing of mind and body. But there it is, in the second-to-last, a reference to peace. I mention all this because of a post I did at Thinking Out Loud, where a U.S. pastor had his congregation complete an index card indicating the trials they were facing and the burdens they were carrying. If Isaiah 53 applies, then it must apply to the point of bringing peace to the very doubts, anxieties, fears, angers, jealousies, anger, pride, insecurities, addictions, pain, disappointments, attitudes… and everything else that people mentioned on those little 3-by-5 cards. Clearly, the intent of this verse is that our peace is part of the finished work of Christ on the cross. Peace and healing view sin in terms of the estrangement from God and the marring of sinners themselves that it causes. His sufferings went to the root of all human vice. Lack of peace as sin? Worry and anxiety as sin? That’s what both of these commentators seem to say. The Wycliffe Bible Commentary makes clear however that the peace that is brought is a general well-being, not simply addressing the consequences of sin. But in the Evangelical Bible Commentary, something else is suggested, that the suffering servant of Isaiah 53 is bringing a peace that represents the restoration between God and man. I’d be interested if any of you can find any blog posts or online articles where this particular phrase is addressed apart from the wider consideration of the verse as a whole. At this point, let’s conclude by saying that the finished work of Christ on the cross is sufficient for all manner of needs we face; all types of burdens we carry. I don’t know what combination of events over days, months or even years has brought you to this place right now, right this minute, of reading these words; but if the five words at the top of this article arrested you in your tracks somehow, then this is for you. As I type this, some friends of ours are dealing with a situation for which we had hoped there would be a very different outcome. There is great sadness, all because someone was going through a tough time, and perhaps, as we do in tough times, was looking for an exit sign. Not finding one, they created their own exit. I believe in a lot of things. I am a person of many strong convictions. And yes, some of those are spiritual convictions; the kinds of things I am going to wager that you’ve already heard about many times. The annals of history are filled with stories of people who reached the point of despair at which you find yourself right now; but people who pushed past that point and now live to tell the story. When you’ve reached bottom, they will tell you, then you’re at the point where you can only look up. Even when it seemed impossible. God will make a way, where there seems to be no way. Please watch this video. And then click back here. I know there’s someone reading this right now, and you’ve never heard that God loves you. Hear it now. The God who created the universe loves you. You are loved! You are loved! I don’t know what do. Sometimes I’m thinkin’ that I’m never gonna see the light. Fear what tomorrow may bring. It’s raw, it’s honest and it’s very transparent. Just a scared person crying out to God. And I believe he meets me every time I cry out to him. And I believe he will do the same for you. I hesitated to write this. Just three short weeks ago, I wrote about confession in general, and the website PostSecret in particular. While it would have been more simple to devote that space to a discussion about why it is that we have this need to vent or get something off our chests, I wrote instead about the fact that this type of confession doesn’t really go anywhere beyond confession itself. It lacks what we experience in a liturgical church service following the confession of sin: The assurance of pardon. Why am I returning to this subject? While this sort of thing may not be your preferred brand of reading — perhaps you consider it prurient or voyeuristic — I think that every once in awhile something of this nature bears reading; in this case for two very particular reasons. First of all, these were Christian readers responding to the opportunity, not readers from among the general population. 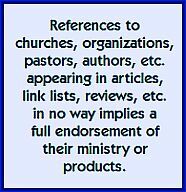 In fact, a very noticeable percentage of them were pastors’ wives or pastors; something very reminiscent of Anne Jackson’s books, and her current Permission to Speak Freely book tie-in website. Apparently, clergy families are in desperate need for an Ann Landers or Dear Abby page on which to bare their deepest hurts. As we are all from time to time. Secondly however, and this is why I’m linking to this today; at what I’m sure was great personal emotional exhaustion, Mandy took the time to answer each and every response. That’s with the number of comments closing in on 200. What if I told you I’m impressed? This is the blogosphere at its best. When someone tells you that blogs are a waste of time, let them see what’s happening at MandyThompson.com, and then don’t miss some of her post-mail-avalanche comments that follow more recently. If you’re a blogger, do you see what you do as a ministry? Are there times someone left a comment that resulted in you taking on the role of counselor? If you’re a reader, have you ever had a blog writer that you really connected with and received help from? For either category, have you ever continued the dialog off-the-blog? The long hot summer is just about over, and the kids are back in school. Time for a look at the pages that grabbed my attention this week, with a little help from our friend (at right) the links lynx. First of all, there’s a live event online tomorrow (Thursday September 9th) night: A Night of Worship, streaming live from North Point Community Church at 7:30 PM Eastern, 6:30 PM Central. To watch at home you need enough bandwidth to capture the live feed, and this website. When Chad Holtz isn’t busy pastoring a rural Methodist church, he’s busy confronting evil at the local Islamic Center. Sort of. Greg at the blog, Lost in the Clouds posts an edgy response to the Christianity Today cover story Hipster Christianity by Brent McCracken based on his book of the same name. Greg says “I’m sorry, but all of this is adding up to a sorry picture of our tour guide through the world of Hipster Christianity…” I think he struck a nerve. Students at Belmont University are being handed cash to make a difference. 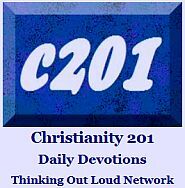 Donald Miller explains the $20 giveaway; but I wonder what they’d do if — after the manner of Matthew 25 — one of the students simply handed back $40? Carlos Whitaker doesn’t want attendees at the Catalyst Conference to be singing the songs he chooses, so he asks his readers to report the song titles they are connecting with at their churches. So far, over 125 replies. Frank Turk, who probably doesn’t write a lot of music reviews, joins a number of bloggers who are noticing what can only be termed a “modern hymnwriter,” Matthew Smith. Andrew Jones lists five major game changers that revolutionized who he is today. People in ministry, don’t miss this one. Thom Turner knows that baptism can be a divisive subject, but suggests there’s room for diversity even within denominations and possibly within local churches as well. If you missed the blog tour — actually it was more like a progressive dinner — for Anne Jackson’s Permission to Speak Freely (Thomas Nelson), you can still catch all seven excerpts by following the links, starting here. Anne’s honesty will resonate with anyone dealing with various types of pain. Brian, a regular reader of this blog, invites you to join him and others in a week of prayer for Beja people — nomadic camel herders — of Egypt, Sudan and Eritrea. Read more here. Our video link this week is a worship song you may not know by Willow Creek’s Aaron Niequist, simply titled Changed. U.S. Fundamentalist nutcase Terry Jones is determined to burn copies of the Quran on September 11th — I doubt even the U.S. President could stop this guy — so as of Tuesday night officials announced plans to quell access to his property through an identification checkpoint, so fewer people can see him do it. John Stackhouse has no problem with street preaching, but that’s usually in commercial areas, right? What happens when the preachers invade a residential street? That, he says, is going too far. Anglicans in Nova Scotia, not content with the annual “blessing of the pets” service, are having a “blessing of the techs” service for laptops, cellphones and mobile devices. This may be your church, or at least your church sign: Grace Methodist Episcopal in New York, circa 1922; from Shorpy.com; a classic photograph site. Middle picture is from the Gospel Mission in Georgetown, circa 1920; final picture is a storefront church from the “Black Belt” of Chicago in 1941 and where deciding where you’re going to eat after church isn’t an issue with the lunch wagon next door. Click through any of the pictures to see the images in super-giant size. Lisa Elliott is a mother of four, closing in on the first anniversary of her son Ben’s passing away due to cancer. Her writings on Facebook (group name: The Ben Ripple) would — and I believe someday will — fill a book. This past few weeks and as we draw closer to August 19 when it will be one year since Ben changed addresses David and I have been incredibly sad. This past Sunday in particular, for no specific reason, was extremely sad and emotional for me. It wasn’t my typical “tidal wave” of emotion that hit me. Rather, it was more like a “tsunami” and it took me under for most of the day. Joy also knows that God can only heal pain when we allow ourselves to feel it. Joy is soft-spoken and a woman of few words, but her presence assures me that no words can reach into the deep places of my heart that are meant for God alone. Joy gives me the time and space I need to meet God in my pain. Joy stands aside and doesn’t interfere with what God is doing in the deep inner recesses of my heart. Joy doesn’t try to fix me. Joy has no words of advice for me. Joy just listens. She fully realizes that the kind of healing I need, God alone can give. Joy is okay with my pain. Joy knows full well that sometimes there are just no words to describe my pain. Joy lets me be real about my raw feelings and doesn’t leave my side just because I’m having a bad day. Joy reminds me that although the pain never fully goes away, it will get easier to deal with in time. Joy assures me that eventually I will remember happy memories of Ben with a smile on my face and not just a tear in my eye. Joy demonstrates to me that life can go on, making new memories and learning new things about God as I do. Joy rejoices with me and my small baby-step victories. Joy has told me that it’s okay to want to be alone to rest, recover and take the necessary time to heal. Joy has warned me to be real about my pain and not try to conceal it. Joy celebrates the ways that God is using my pain to reach others and sees the potential of the “ripple effect” in and through my life. Joy allows me to worship through my tears. Joy sings alongside me and my pain in a beautiful harmony. Joy lets me be sad when I’m with her and has shown me firsthand that joy and pain can truly co-exist. “You have made known to me the path of life; you will fill me with joy in your presence” (Psalm 16:11). “I tell you the truth, you will weep and mourn while the world rejoices. You will grieve, but your grief will turn to joy” (John 16:20). If you’re like most of us, you attended church somewhere yesterday, heard a good sermon, and probably picture your pastor today with his feet up, reading the paper while sipping fruit juice; relaxing on Monday. But a pastor’s life isn’t like that; not for a minute. If physical stress doesn’t weigh heavy, often emotional stress does. I was going to save this post by Pete Wilson of Nashville’s Crosspoint Church for Wednesday’s link list, but I really want to make sure y’all read it in full. (Yes, I’m writing from Canada, and I just said “y’all.” Go figure.) Besides, it’s a holiday Monday nationally here, and my creative department is shut down for the day! 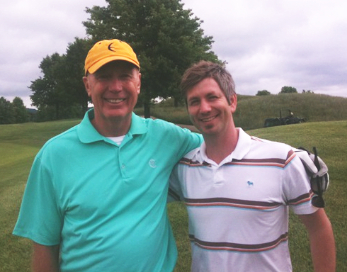 The picture — which he posted the next day — is Pete Wilson on the golf course with Max Lucado. I had to retouch it a bit to make sure it wasn’t just a generic guy in a hat! ‘Whiplash’ is a word I’ve used more than once when describing the emotions I often go through as a pastor. Yesterday was a difficult day. I apologize in advance for the length of this post, but I need to write this now more than you need to read it, so please bear with me. Let me give you a little back story to help you understand. Over the course of the past two years Brandi and I have had two sets of friends who have experienced the loss of a baby. Todd and Angie Smith who lost their baby after two hours of life and Mike and Holly Phelps who lost their baby late in their first pregnancy. I can’t even begin to imagine the heavy heartache and deep loss they went through. And while getting pregnant again doesn’t take a way that pain, you can imagine how excited I was to hear that both couples were once again pregnant. While each couple faced their own unique challenges, they were both on track to have healthy babies. I couldn’t help but think of what a bitter sweet experience it would be for both of them. A glimmer of hope in the midst of the darkness they’ve been walking through. In the early hours of yesterday morning, in hospitals just two blocks away from each other, both couples had an pre-term delivery. Yesterday morning I walked into two different hospital rooms. Both scenes could not have been more similar and yet more different. Both rooms had moms who were laying in hospital beds. Both rooms had dads who were right by the bed holding and rocking a tiny infant. However, the similarities end there as one baby was breathing and the other was not. Todd and Angie’s room was full of prayers, crying and pure joy. There was life. Mike and Holly’s room was full of prayers and crying, but no joy. No life. How could this happen to them again? Why God, would you allow this family to endure this pain yet again? Haven’t they been through enough? I’ve been criticized in certain circles for writing a book called Plan B: What Do You Do When God Doesn’t Show Up The Way You Thought He Would?, which is about God, crisis and pain. A book that clearly states I don’t think there are answers to all of life’s questions and complexities. I dare any one of those critics to stand in the room with this young couple and even try to answer all of the questions they had yesterday as they sit there holding their lifeless child. I don’t know if I’m allowed to say this as a pastor, but I’m going to anyway… Isn’t it amazing how in a moment like that you so desperately want God near, but at the same time you also feel secretly mad at Him? Reality for Christians often means we have more questions than we do answers. Reality is sometimes lacking the faith that will give us a sustained hope. Reality is even though we know God is with us sometimes we feel completely alone. Reality is even though we believe, we also doubt. There’s a big difference between trust and understanding. They say trust is what we need when we don’t have understanding. So today I’m praying for trust. A big, huge, helping of trust. I’m asking you to trust that one day faith will win over doubt, that light will win over darkness, love will win over hate, and all things will one day be redeemed. I’m asking you, right in the middle of your Plan B pain, to trust this process that is going on in your life. I never knew when I wrote those words how much I would need them on a day like today. ~Pete Wilson, pastor and blog-author of Without Wax. A year ago at this time I was asking blog readers to join us in praying for Ben Elliott, an 18-year old who was stricken with leukemia. Ben and my oldest son Chris were briefly in the same Sunday School class together. Sadly, Ben’s body lost the fight; it would be wrong to say that Ben did, Ben really didn’t lose anything. But his family definitely felt a loss. In the time leading up to Ben’s death, his mom, Lisa, kept a Facebook page going titled “Pray for Benjamin Elliott.” In it she chronicled all of the medical and emotional highs and lows of Ben’s battle with this disease. Afterward, she kept posting articles and the page was renamed, “The Ben Ripple.” Like the concentric circles radiating from the a center, there have been many, many ripple effects from all who were involved in or heard about Ben’s life and passing. There’s no word to define it. If you wish to read some very well-written expressions of a mother’s pain in the loss of a son, I cannot recommend Lisa’s page enough. Unfortunately, there’s nowhere online I can direct you at this point, other than to join the Facebook group and subscribe to future items. If you live in Ontario, Canada; Lisa is available as a public speaker for events including all-day women’s retreats. If you got here from WordPress or Google tag-surfing, and you’re going through your own great sadness, let me encourage you not to “write off” Jesus just because of some previous experience with church or organized religion. Speak to him in prayer, believing he hears our cries, and trust him to meet you in some way. Leave a comment here and I’ll send you some off-the-blog possible next steps. This story of an 18-year old in Cincinnati who hanged herself last July after constant taunts from both school friends and strangers had an eerie resemblance to several other stories that have crossed my path lately. We sometimes call it cyber-bullying, but it’s really just harassment, ramped up to the nth degree. Suddenly, my mind flashed back to a scene in a different era several decades ago… A group of teenagers returning from a weekend at the beach. The cottage, situated on one of the Great Lakes, was owned by a good friend, and his dad was driving us home. He’d dropped people off one at a time and arranged it so at the end it was only my friend and I left in the car. The chances of you reading this are one in a gazillion, but I need to know that it’s out there. Perhaps someone else will read this who isn’t you and doesn’t know me; but they’ll claim it as their own. Perhaps by some miracle you’ll see this and recognize my name and know it’s for you. We like to think things were better back then. There was no e-mail, or texting, or instant messaging, or Twitter. No matter what people thought about you, you could go home and shut the door and be within the safety of your family. I don’t know if your family provided that kind of refuge for you, or if our remarks were so hurtful that you went home and cried. We didn’t really mean to hurt you. We thought you were in on the gag. Looking back, you were probably just being brave, just being defensive. Today, the kids have all this technology and we know that bullying doesn’t have to be physical, it doesn’t have to mean picking a fight. While we didn’t have the technology to invade the sanctity of peoples’ homes and continue the harassment; we should try to remember that we weren’t that innocent in those innocent times. People were mean and cruel and said things they shouldn’t have; and some of us didn’t know when to quit. So, RG; I’m sorry. I hope you were able to triumph over our high school stupidity and that you’ve made a good life for yourself all these years later. For what it’s worth, I went to church back then, but didn’t understand the dynamics of living as a Christ follower. I didn’t let my faith deeply impact my behavior. I didn’t know my life was supposed to reflect a difference; a distinctive; patterned after the One I had pledged myself to serve and obey. Some of that came together during the very last weeks of high school; some I figured out in the second term of first year university; some came together when I was 21; some I learned when I got married and had kids of my own; some stuff I worked out last year and last month; and a lot of what it means to bear the name of Jesus Christ I truly have yet to learn. Yesterday I read a story about a young girl in Cincinnati and how the taunts of her friends and acquaintances drover her to the lowest point. I read of the agony of her parents; the grief of losing their only child, and all the hopes and dreams and aspirations they had for her. And suddenly I thought of you; I thought of us; I thought of that cottage weekend when I simply didn’t know when to shut up. I wish I could relive that weekend over again; and I wish I could have been a true friend, instead of using you as a prop for my personal love of attention. It’s never too late to say you’re sorry. I’m sorry. While looking for a graphic for today’s post, I came across this, which also provides some food for thought.